Q. How do I get the required licenses? A. You can purchase hunting licenses on the web at (www.gf.nd.gov). 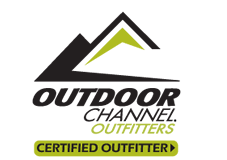 Due to changes by the ND Game and Fish we are no longer able to sell out-of-state licenses at our office headquarters. Q. 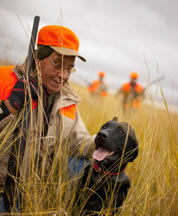 What is required to obtain a ND Hunting license? A. If you were born after 1961 you must possess a hunters education ID number in order to obtain a ND hunting license. You must have this number available while purchasing the license. If you do not have a hunters education permit you may hunt for 1 year under an apprentence license if you qualify under those regulations. Please check out the ND Game and Fish website to view criteria. Q. What vaccinations do my dogs need? A. North Dakota state law requires a current rabies vaccination. Q. How large a group can be accommodated? A. Groups of 3 or more can be accommodated. Each group will have a guide and dog (if needed) and larger groups we have additional guides assigned to assure a quality hunt. Cannonball will not combine hunting groups. Discounted group rates may apply, please call for details. Q. How do I get to Regent? A. Rental cars are available at the Bismarck and Dickinson airports. From Bismarck , head west on Interstate 94 to the Enchanted Highway at exit #72 and follow it into Regent. From Dickinson exit #72 is 11 miles east on Interstate 94. The Cannonball Company can also arrange for hunters to be picked up at the Bismarck or Dickinson airports. Q. How and when do I book the hunt and is a deposit required? A. In order to obtain the lodging and time frame of your hunt, it is best to book as early as possible. Weekends and early season are quick to fill. To confirm your lodging and guide assignment, a 50% deposit is required at the time of booking. For additional details, please contact us. Q. Are there discount rates for larger groups or late season hunts? A. Yes, Please contact us for additional details. Q. When is the best time to hunt pheasants with the Cannonball Company? A. Pheasant numbers will be strong even up to the last day in early January. The pheasants in our area are educated quickly and will get more challenging to hunt as the season progresses. Working to outsmart these crafty birds is what makes North Dakota pheasant hunting so exciting. A. The following is from SB 2318 introduced in 2017, regarding the pheasant opening dates: The open or lawful season on pheasant and the open or lawful season on duck may not commence on the same weekend. Except as otherwise provided in this section for the opening of pheasant season for youth, the open or lawful season on pheasant may not open earlier than one-half hour before sunrise and the season may not commence earlier than the first Saturday of October nor later than October twelfth of any given year. The governor, in the governor's proclamation, may provide a pheasant hunting season for youth. Please check with us for specific dates. Q. Are there any other upland game birds I can hunt? A. The Cannonball Company is famous for it's fantastic pheasant numbers but we also have limited numbers of Sharptail Grouse and Hungarian Partridge that offer an additional challenge for our hunters. A. Yes, we always welcome the non-hunter and there are a number of attractions for them to enjoy. Q. What size gun and shot should I use? A. Our wild birds are very hearty and quick and surprise many of our clients who have shot released birds. We recommend a minimum of a 20 gauge and the vast majority of our hunters use a 12 gauge. These wild birds are more difficult to bring down because of the heavier layer of feathers and we recommend 4 and 5 shot. It is always a good idea to spend some time shooting clay targets prior to arriving to better enjoy your hunting experience. Q. Do you provide dogs or can I bring my own? A. Your guide will have a dog however, nothing is more enjoyable than hunting with your own dog and we encourage you to bring them along. Q. What if I have my own motor home or lodging? A. The lodging rates will be subtracted from your daily hunting rate. Please call for additional details. Q. How far is it to drive? A. Regent is 5 hours from Billings , 9 hours from Minneapolis and 11 hours from Denver . We are just 35 miles off Interstate 94. Q. Will I be assigned the same guide for the duration of the hunt? A. The Cannonball Company makes every effort to keep the same guide for your entire hunt. Q. What if one or more of the hunters is handicapped or cannot walk long distances? A. We have a large variety of hunting areas and we are able to place hunters where they do not have to walk far to take advantage of our great hunting.